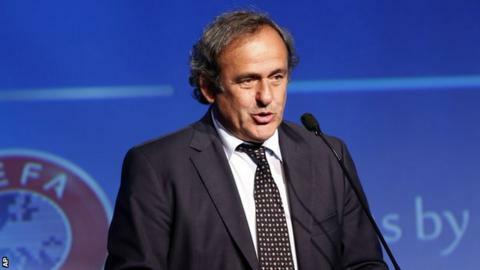 Third-party ownership of footballers is a form of "slavery", according to Uefa president Michel Platini. Last year, Fifa agreed to ban the practice, in which investment companies take a stake in the economic rights of players, and will discuss a draft proposal to implement this in May. Officials from some leagues, including Spain and Portugal, oppose a ban. But Platini said: "I think we are dealing with a type of slavery that belongs in the past." Responding to a question from Paris St-Germain head coach Laurent Blanc, as part of an online interview with football figures and fans, Platini added: "I have put a lot of pressure on Fifa to stop third-party ownership of players. "Today it is shameful to see some players with one of their arms belonging to one person, a leg belonging to a pension fund located who knows where and a third person owning his foot. "So it's about time the world of football wakes up and that the money coming into football remains in football and doesn't disappear right or left or I don't know where." Third-party ownership was banned by the Premier League in England at the start of the 2008-09 season, following the discovery that the economic rights of Argentine players Carlos Tevez and Javier Mascherano were owned by two offshore companies when they joined West Ham in 2006. Premier League and Football League rules now require clubs to buy out any third parties that claim to own the economic rights in a player before their transfers are permitted in the top flight. However, the practice remains prevalent in South America and parts of Europe, where clubs routinely share the ownership of a player with other companies. Third-party ownership (TPO) - what will happen under proposed ban? Existing TPO player contracts can continue until they expire but they cannot be extended. New TPO deals can be entered into until the end of April. However, they can only be for up to one year. Fifa has recognised that converting TPO contracts will be an enormously costly process for many clubs, so the detail on how they will implement the ban has been looked at by a working group. It is due to present its draft proposals on the issue in May. Final decisions could then be taken at Fifa's annual congress that same month. TPO will remain a factor within the game for some years while existing contracts run down or the economic rights are wholly bought up by clubs. Fifa has, however, signalled its determination to eliminate it from the game in the longer term.